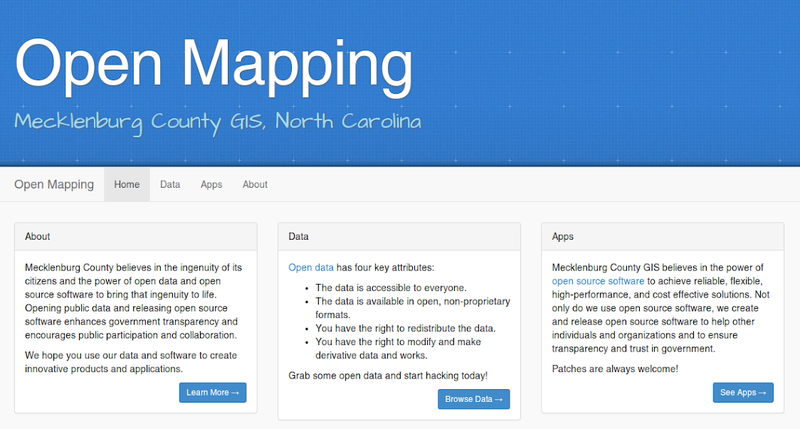 Mecklenburg County has opened the people’s GIS data. As in really open (MIT). As in all of it. A day will come when I do something that doesn’t scream Bootstrap. But not this day! One of several unfortunate parts of North Carolina’s public records law is that it allows government to charge for GIS data, and many local governments do, including us up until a few weeks ago. I’ve heard a number of arguments for this practice, with the common thread between them being they’re all terrible. I’ve been hammering away at this for years, opening up some data here and there as I could. I managed to get it to a that’s something we should look at down the road state, which in government is marginally better than no. But the County decided to change payment processors and the vendor of our online sales app wanted ~$10k to migrate it. At our profit levels that would have taken approximately infinity years to recover that cost. Hence we went from down the road to do it before the old site breaks in October in short order. Victory? I don’t know, but I’ll take it. And here’s the next cool thing - we’re having a Hackathon! Sorta! The sorta part is that it isn’t really a thon, just a hacka. You don’t have to camp in a room for 24-48 hours alternately pounding a keyboard and Red Bull. Just sign up by the end of October and be done by November 15th. Teams from 1 to 5 members can participate. You’ll have a chance to display your wares to an audience and a panel of judges at GIS Day in Charlotte on November 20th. There are prizes and the winning apps will be prominently displayed on as many web sites as I can prominently display them on (the Open Mapping page for one). If you are a student, that would look really good on a resume. Hint. If you are in the area, enter our Hackathon, be awesome, win prizes and get recognized!